From release: Classic heavy metal was shaped essentially by three highly influential bands: Judas Priest, Iron Maiden and ACCEPT. Two of these legendary acts have graced our shores several times but now finally Australia gets to witness the might of the “Teutonic Terror” themselves for the very first time as ACCEPT are set to arrive in November 2014. 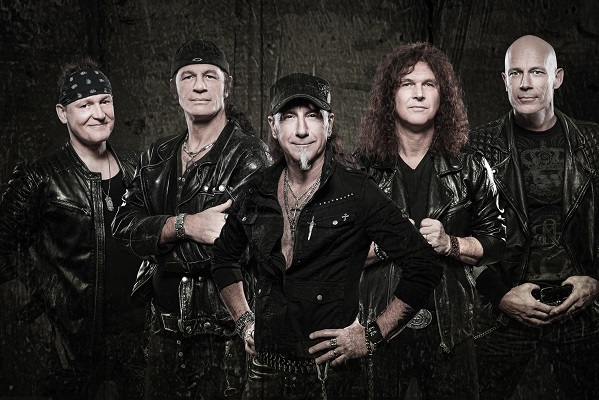 Their anthems of steel are known worldwide and are often cited as one of the earliest innovators of Speed Metal with their track “Fast As A Shark” putting the pedal to the metal like no other before them. You’re coming to Australia for the first time, after so long as a band what has taken so long to get here? Yeah that’s the big secret why it took so long, we should’ve been there twenty years ago at least, I don’t know Australia is pretty damn far away, I don’t know… it’s not around the corner from anywhere else that’s for sure. So when coming to a country for the first time, is it hard putting together the set list? yeah a little bit because we don’t really know if maybe some songs are mostly popular in Australia that we’ve never heard about before, but we have a pretty good idea of what fans want to hear worldwide, and I can’t imagine it’s very different in Australia, but it might be, you never know… I think we’ll be doing alright, well bring a lot of the old time classic songs from the 80’s and a good dose of the last three albums with Mark Tornillo so it should be a good mix. It’s not the long flight I tell you that… seeing it all and meeting different people and seeing a different country for the first time, it’s quite exciting. I want to shake a Kangaroo’s hand if I can. High Energy, that’s two words but that’s alright, I mean we have a lot of fun on stage, not in a goofy way, but we really enjoy what we’re doing and I think that really comes across. Peter and I have been doing this for so long together that we have an understanding when it comes to the live shows and song writing really. You’ve also just released your newest album ‘Blind Rage’ why was that the perfect name for it and what does it represent to you? It’s just a name and seemed to go well with the artwork, we really love the cover of that steaming anger coming out of the nostrils of that bull and that bull represents that pure energy and power and aggression that metal is and it just seemed to be the perfect fit for us. Then it was just a matter of finding a good title that hasn’t been used before, and none of the songs that we had was really working for us so we chose Blind Range, simple as that. What inspires you these days to write the songs? Well musically it’s always about riffs and grooves, it mostly starts with riffs because we just like playing metal riffs, it’s a lot of fun and we have a gazillion ideas like that, but we’re still quite a long ways from a full song, and then you think what is this song going to be about, then once you have an idea of what it could be about, everything gets a whole lot easier, and whatever the stories you’re telling or talking about that sometimes comes from the newspaper, watching the news, reading a book, a conversation, anything really, it’s like that’s a cool idea I could write a song about that. In terms of still creating music and the evolution of technology over the years, what for you has been the most notable change in the way Accept makes music? The tools have changed but the basic process is still exactly as it was thirty five years ago, somewhere along the way when to comes to writing the songs you’re pretty much alone there, then I always go to Peter and the two of us compare notes and playing each other’s parts that we recorded independently and then we work it out together the two of us until we have a song that we both like and like I said earlier we have a blind understanding and not a lot of words need to be said, the work goes actually quite fast when we lock ourselves into a room. The tools and how we record is dramatically different, back then it was for demo purposes it was cassette recorders which are no longer around, now everything is computers and macs and pro-tools, it’s a bit fancier but it doesn’t give you better ideas just because you record on fancier tools, it’s still about the song, if you’ve got a crap song all that stuff doesn’t help you with anything. So the core essence is all about the song, does that melody grab you, or that vocal line or that guitar lick, is that something that people will hang on and grab on to or is it just something forgettable. The other way is you can have the crappiest sound and the crappiest producer and as long as the song is good it will always come across. And you worked again with Andy Sneap as producer, what is it that he brings to the band that you love? I have to ask about ‘Balls to The Wall’ which is now over 30 years old, do you still get the same buzz playing it now as you did when you first released it? Not so much in the rehearsal room, I would never pick that song and jam on it, but when it’s in front of an audience heck yeah, because it’s usually the highlight of the night, everyone starts chanting along and getting into the choruses and the house comes down and it’s quite amazing. I remember getting guitar hero and ‘Balls to The Wall’ was on it, now I knew the song of course, but did you find that those that didn’t know of the band before got somewhat introduced to you from the video game? A little bit, there was a little bit of a buzz back then, everyone was talking guitar hero back then, I’ve never personally played it but I remember it was quite a big deal there for a while. Touring wise over the last few years you guys have been busy with some big festivals and plenty of shows, what’s your favourite thing about the live aspect of Accept? There’s something quite magic when you go out there and you live for the moment, in the studio everything is for eternity and you start thinking in those terms because I better be careful what I put down on this album because I have to live with it forever and ever, where with the live show it’s just for now, for nothing else, for that one moment and time goes by real quick on stage and you kind of forget everything else and it’s quite an experience. It’s weird *laughs* you walk on stage and before you wake up the show is over, and you don’t even think about the time, it never feels like two hours, sometimes you drift away in your thoughts, you wake up and it’s all over, it’s weird. Especially when you’re on tour as routine kicks in and you’re almost on auto pilot, and you’re really enjoying it then as you don’t have to think about it much anymore, when it’s the first show in a long time you tend to be concentrating on what you have to play, what song comes next, this lead break or that one, you start thinking more. The longer you do it, and the longer you play you can just let go and enjoy the moment. This will be hard to do, but over your entire career so far, has there been one moment that stands out for you that you always look back at most fondly? Oh… quite a few, as you can imagine there’s one incident that stands out above the rest, but there’s certain highlights, certain shows that we all remember, maybe it was the first time this, or the first time that, or the biggest this… there’s been so many, let me pick out a few here. Just a couple of weeks ago we did probably the biggest show in our lives, was in front of 750,000 people in Poland and that will always stand out. Then we played a couple of shows with AC/DC a couple of years ago in front of huge crowds, and being on AC/DC’s stage opening up for them was a huge honour for us and makes everything come full circle because we’ve been AC/DC fans for all these years since the late 70’s, and actually recorded one of the songs that was written by one of the Young brothers for AC/DC, we ended up recording it, it’s called ‘I’m a Rebel’ so it’s always been a strong AC/DC connection in our band, so to finally be on the stage with them was quite amazing. You’ve been there from the start, seen it all and done it all, what do you still enjoy about being a part of this band all these years? Oh, just about everything really… so many aspects, it’s not just one thing, I enjoy the song writing process for what it is because it’s quite a magical creative time, I enjoy the satisfaction of doing something meaningful to fans around the world and talking to people about how much this music means to them and getting positive feedback on what you’re doing is quite fulfilling. Then there’s also a band is also like a company in a way and just to see it grow and get bigger and better at what you do is a lot of fun, so there’s that aspect these days, the business side of things that I’m not so involved in but we’re sort of a family operated business, we have a lot to do with that aspect as well, it’s just fun to see it grow and get better and the tours taking shape, that’s fun to build it back up, because we built it from scratch about five years ago when we decided to regroup the band with Mark Tornillo, we didn’t really have any anything anymore, we didn’t have a label, shows booked or nothing, just an idea, then just to see it grow into what it’s become now over a few years is quite amazing. Take a good well deserved break because we’d have been on the road for three months straight by then, and hopefully this album will do good things, I’ve got a good feeling so far that all the signs are positive.